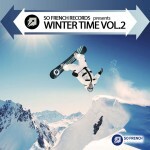 The Winter Time Compilation Vol.2 Teaser! Prepare your snowboard and mp3 ipod to surf this winter! We are proud to introduce you the brand new teaser of the forthcoming ‘Winter Time Compilation Volume 2‘!